Ok, I decided to try a little 'C'ode work with the DB101 and downloaded the IAR Kickstart and AVR483 from Atmel. AVR 483 mentions a code package that's available(pg11 of AVR483) but no code seems to be present at Atmels site. It would help in "Getting Started" if the code was there to go along with the Appnote. Anyone know where this code can be found? Downloading Kickstart from IAR was a fun experience also - first time it crapped out with 2 mins to go in a 40min session. Also is there just the hex file for the updated demo software(being able to use the terminal ) for the DB101? Did you download AVR481 & AVR482 ??? Also, I believe the attached PDF files are the correct information needed for the graphics display, itself. AVR482 was too large to attach. Attached is the latest demo code, compiled from Martin Thomas' GCC port of Atmel's code. Yes, AVR481 and AVR482 are the zips you want. Yes I did but did not find the code for AVR483 in there. If you look at AVR483 on the ATMEL site you will see what I'm asking about (no file icon next to the PDF). Thanks for the thought and hope you have a good year too! The latest (I think ) demo is in there (in IAR format)but it exceded Kickstarts code size. Just downloaded the 30 day evaluation for IAR and will play with that. Thanks for the latest hex file. Will load it in and try out the terminal which was disabled on mine.Saw about the half-duplex if using rs232 to PC but was not able to try. The hex file loaded in fine(thanks again Dean) and the terminal program starts up ( got to make up a cable to test - soldering iron warming up). Tried to use the 30dayeval of IAR but got some errors trying to build up the demo code (total newbe when it comes to C) but will work on it later. Got characters receiving on the DB101 (parameters other than default do not get saved when power is removed). Now to find out what the terminal program will accept as commands. Yes I did but did not find the code for AVR483 in there. If you look at AVR483 on the ATMEL site you will see what I'm asking about (no file icon next to the PDF). I think all the c and h files are in AVR482.zip as Carl mentioned. Could be wrong, of course, but I think they're there. "I may not always be right, but I'm never wrong! " I don't think the Atmel team has released a prospective date, yet! But I'm not really sure that the three color LED back-light will offer as much as a true color display would. I guess that you could have the thing automatically change colors every day, or something. Red could be a fault or warning alert - mummy is near, so no drinking or smoking. Blue could be an indication that it's now okay, mummy's gone and anything goes. Green could tell you "Watch out! ", Incredible Hulk is in the area. And Yellow could be an indication that your too chicken to face him alone. If you're trying the GCC port of the IAR code that was posted here, there are some bugs trying to compile it under IAR. I need to send a patch to Martin to fix those. So, there are two versions of the code. The IAR version you can download from Atmel, or Martin Thomas' port to GCC you can compile with WinAVR. The latter should also compile with IAR, but doesn't quite do so yet. Edit: I happen to own IAR and like it. But, unless you know you really have a need for it, I'd recommend that you use WinAVR (or avr-gcc on Linux) and use Martin Thomas' GCC port of the Atmel code. Blader, after owning and using IAR for a few months, I agree. Still, for the OP, GCC may well be the smartest choice. But not the main.c file for AVR 483. The main.c file found in the AVR482 folder is for the demo that is loaded on the DB101 (AVR482) and not the file that is mentioned in AVR483. Has anybody actually looked at AVR483 page11 note16. ? 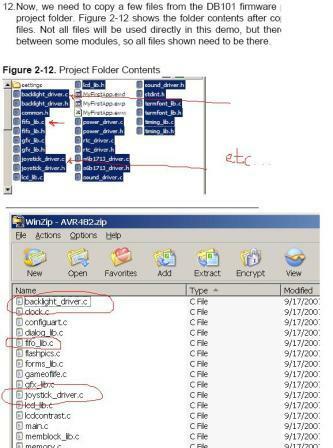 Yes all the necessary driver files are there in the AVR482 folder to copy over but there is one file lacking and that is the main.c file referenced by AVR483. The reason for going with IAR is that it was the software described in AVR483 which is basically a guide for doing a first app on the DB101 using the IAR Workbench(for those that have not read it)and also it is free for now which colored my decesion to use it (I know GCC is also free ). I'll say it again "I for the life of me cannot find the file that is refered to in AVR483 (main.c) in the avr482 folder (not the main.c for the demo code)".